Up to one hour fire resistance. Slimline construction - only 40mm thick. Free area in excess of 50%. Low maintenance - no moving parts. 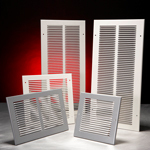 Tecfire intumescent dampers (air transfer grilles) have been designed and are manufactured to prevent the spread of fire through ducts or apertures in fire resisting elements such as partitions and doors. Tecfire dampers are produced from PVC slats filled with a high performance intumescent material which are assembled to form a matrix. In the event of a fire the slats and framing components swell to many times their original thickness, fusing together to form a non combustible mass which prevents the passage of hot smoke and gases. Tecfire dampers have been tested and assessed by the Warrington Fire Research Centre and maintained their integrity for a minimum of 60 Mins. A copy of the Warrington Fire Research Centre's report, No: 135318, is available free on request. Tecfire dampers consist of a sodium silicate intumescent material encapsulated within 40mm x 6mm PVC extrusions which are assembled to form a matrix, mortised jointing of the damper slats to the intumescent outer components eliminates any need for any metal componetry. (Circular units have a pair of outer aluminium rings). 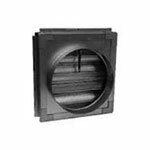 Each damper is manufactured 2mm less than the corresponding duct or aperture size to provide clearance during installation. 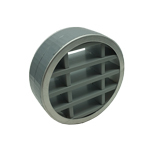 Tecfire dampers are available up to a maximum size of 600mm x 600mm in 25mm increments. Ducts - Tecfire dampers should be secured within ducting using not less than 4 self tapping screws (on circular units two self tapping screws must be used tofix each aluminium ring). Doors and Partitions - Ensure that cutting anaperture in the door will not detract from the fire integrity of the door. Contact the manufacturer to establish maximum size and optimum position. Cut the aperture to the required size with a gap all around of 3mm. Apply intumescent mastic to the inside faces of the aperture. Fit the damper into the aperture and ensure that it is positioned equidistant from each face and parallel to both faces of the door. Fit retaining 25mm wood screws through the pre-drilled holes in damper outer uprights into door. Clean off surplus mastic and ensure outer edge of damper is fully sealed. Position pressed steel cover grilles centrally over both faces of the damper and fix with 25mm wood screws. 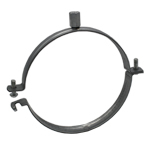 Tecfire dampers contain no moving parts and require little or no maintenance. Units may be dusted or cleaned using a vacuum cleaner or brush. 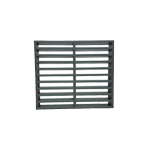 We offer a comprehensive range of steel return air grilles with a white stove enamelled finish or aluminium grillesin a variety of styles and finishes including non-vision grilles. Intumescent sealant for gap sealing between ducts and dampers is available ex stock. Note: Tecfire dampers are not suitable for applications where high levels of humidity or wetness are anticipated for these applications please refer to your local branch for alternative products. Tecfire dampers should not be used in hot air ductswhere the air temperature exceeds 70ºC.